Welcome to guest blogger Deana Sidney of Lost Past Remembered, a blog dedicated to discovering, replicating and adapting historic recipes. In this saucy series she demystifies one of the cornerstones of classic French cuisine: the mother sauces. 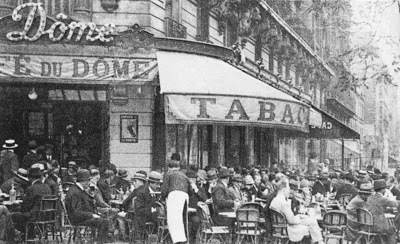 When I think of the Paris of Hemingway and Picasso, I think of Blanquette de Veau. It was one of the first classic bistro dishes I had in Paris as a student. Honestly, it was a disappointment because the veal wasn’t very good. I knew the dish had greatness in it and tried making it differently. 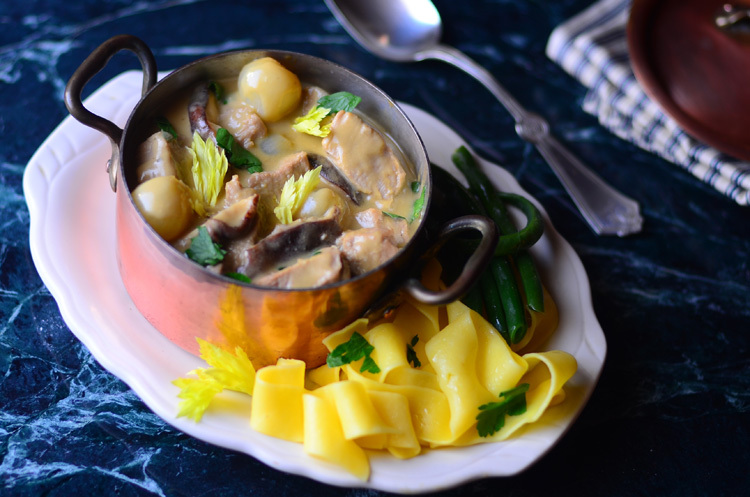 As part of my sauce series, Blanquette de Veau uses one of Careme’s mother sauces. The Allemande is chicken stock-based velouté with egg, cream and lemon (also called a Sauce Blonde or Sauce Parisienne). With a sauce this luxurious I wanted a cut of veal that would be equal to the dish. 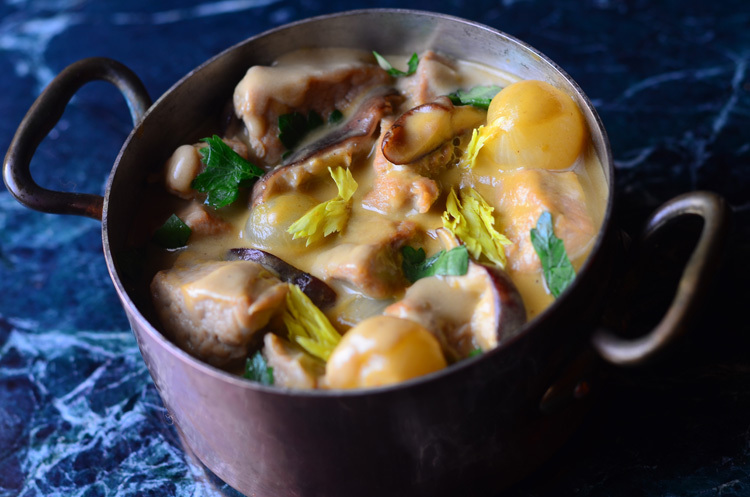 Instead of using traditional veal shoulder or neck cuts, I went for the tenderloin for my blanquette de veau and was over-the-moon with the results. A very light cooking resulted in soft pillows of tender veal in the beautiful sauce. In this recipe, you don’t brown anything, so it has a more delicate flavor. Served with noodles or rice it will become a favorite. All you have to do is make a few adjustments to get the flavors missed from not cooking the veal for a long time –– I think it’s worth it. Take the veal cuttings, vegetables, bouquet garni and stock and put in a large pot (a wide-mouthed enamel cast iron pan is perfect). Heat it and simmer on medium-low for 1½ hours, skimming and checking as you go. While you are doing this, take ½ c of the stock from the pan and 2 T butter and simmer the onions covered for 10 minutes. When they are nearly done remove the cover and reduce the liquid till it is syrupy. Remove and reserve the onions and the glaze. After 1½ hours, strain the stock, pressing on the solids and then discard the vegetables and meat bits. Add the demi-glace to the stock. You should have around 4 cups. You can do all of this the day before so that the dish comes together quickly before the meal. Rinse the veal cubes again and add to the stock**. Cook for about 15 minutes over very low heat… barely a simmer. Check it –– you want it medium rare (you will need to heat it again when you add the egg and cream, that’s when you will finish cooking the veal). When it’s done, remove the meat and strain the broth over a fine mesh. Reserve 3¼ cup of the stock for the velouté. Clean out the pan and place the meat and onions with the glaze in it. Cover (you can do this the day before too, but I think veal is best the day it is cooked –– you can do the rest of the recipe earlier in the day and heat it gently if you would like. Melt 4 T butter slowly, then add the flour and stir it in –– let it cook for a few minutes but do not let it brown. Slowly add the stock, whisking. Add vermouth and cognac. Cook it over medium heat for 10 minutes, stirring regularly. Add the sliced mushrooms tossed in the lemon juice and cook for another 10 minutes or until the mushrooms are soft. This cooking is what helps give the sauce the beautiful texture… don’t rush it. Remove 1 cup of the sauce without the mushrooms. Whisk the egg yolks and cream together and add the reserved hot velouté. Add this to the meat and onions and cook over a low heat, stirring gently. Do not let it boil. Keep the sauce below 180º or the egg will curdle (using a wide-mouthed casserole makes this easy). Just for the heck of it I checked the temperature of the veal cubes –– they seemed to be around 145º –– perfect medium. When everything is heated though taste for seasoning and add salt and pepper if needed, serve with noodles, rice or potatoes. Sprinkle with parsley and celery tops (I love the flavor of celery tops, originally, they were what was used and the bottoms were tossed!). The dish re-heats successfully in the microwave too. * Alisha at D’Artagnan said she made this dish with veal cheeks. I read up on them and found that about 4 pounds cleaned of silverskin would give you about the right amount. They would cook for a few hours till tender (it may be 4 or 5 hours on a slow heat). You would skip my additional step. ** There are those who do not like the gray scum that veal can generate. If that bothers you, put the veal in a skillet and cover with water. Bring to a low boil for 2 minutes and then strain and rinse the veal. I did not do this step since I was more into the texture and the cloudy stock didn’t seem important in the velouté.